My go-to resource for web analytics is Avinash Kaushik. Guru does not adequately describe his level of expertise on the topic. If you have any interest in analytics, his blog is a great resource that is chock full of information. The articles are deep dives into the concepts, techniques, and tools that allow you to get the most out of your online presence. For bite-sized pieces of insight, I’d recommend subscribing to his newsletter, which you can do from his website. So what does Avinash Kaushik have to do with the book Be Like Amazon: Even a Lemonade Stand Can Do It? In June of last year, Avinash mentioned the book in one of his newsletters. I have such high regard for his opinions and insights, that I immediately added the book to the top of my reading list. 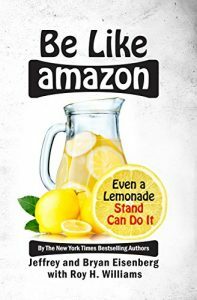 Be Like Amazon, written by Jeffrey and Bryan Eisenberg with Roy H. Williams, is an insightful business read that reveals the basic concepts that any business can use to be successful. As the title implies, a lot of these concepts are taken from Amazon’s success, but Jeffrey and Bryan also show how other companies have succeeded using the principles in the book, or how businesses have failed by ignoring them. As I’ve found with most good business books, Be Like Amazon isn’t a book full of complicated analysis and formulas. It doesn’t contain suggestions that apply to just small businesses or big businesses. What makes the book a great read is that the concepts are obvious once revealed, and the business truths tend to be universal regardless of the type or size of business you may own, run, or be employed by. It also challenges you to take a hard look at your business practices, and it provides a lot of actionable suggestions that you can apply immediately. If I had to pick out one critique of the book, it has to do with the dialog used. To make it easier to digest, the book is written as a conversation between two people at a coffee shop. I don’t have a problem with that part of the book. In fact, that makes it a fun and easy read. What can get distracting at times is the amount of ‘sunshines’, ‘poobahs’, and ‘badda-bing badda-bang badda-booms’ that are thrown around. However, the content is so valuable that I can get past some of the corny dialog. It certainly doesn’t affect my recommendation of the book. I can easily say that Be Like Amazon is a Must Read if you want to understand what it takes for a company to succeed and how you can apply these concepts to your business. As mentioned before, this goes for businesses of any type and any size. I would recommend putting the book at the top of your reading list for this year, or making it a priority for 2019 if your 2018 reading list has become as congested as mine. This entry was posted in Book Reviews, Business and Technology, Must Reads, Startup Lessons and tagged Books, Must Reads, Startups on April 30, 2018 by Gregg Borodaty.